I have been sharing a few words (or more than a few words) about the Book of Daniel, one of the more challenging books of the Hebrew Bible. Like the Book of Revelation, it has a strong apocalyptic component. In the first six chapters of the book we encounter six court tales, stories of life lived by exiles in Babylon. Daniel and three friends find themselves selected for training to serve King Nebuchadnezzar. From there we read of their adventures. There are visions to be interpreted, flames to be avoided, and lions’ mouths to be closed. The message throughout seems to be that despite the situation God is in control. Things might look bad, but God is present. The question is, of course, the nature of this sovereignty. Is God pulling the strings, or do Daniel and his companions have some agency here? I think you can interpret either way, though due to my embrace of the idea that God's love is uncontrolling, this is more difficult for me to say God is in control I do believe, however, that God is present and at work. In any case, with chapter 7, which my study group will embark on today, we see a transition point in the Book of Daniel. The court tales end and a series of visions come to Daniel, the first of these visions seems to parallel that of Daniel 2. The images are different, but there are similarities. The focus is on the rise and fall of empires, and God's final victory. Is that victory guaranteed? It may depend on your theology as to how you answer. In chapter seven we step back in time, to the first year of the reign of Belshazzar, who is, according to Daniel, the Babylonian king. Daniel is asleep, when a vision comes to him in his dreams. He envisions the four winds stirring up the sea, and out of the sea emerges four monstrous, even grotesque beasts. There is a lion with wings like an eagle. While it is an animal, a human mind is given to it, suggestive of Nebuchadnezzar’s situation in chapter 4. Remember that Nebuchadnezzar is driven into the wilderness, lives like an animal, and then has his mind restored. Might this be a reference to that? This beast seems to symbolize the Babylonian kingdom. Then there is a Bear, who may be deformed, but remains powerful. This bear has three ribs between its teeth or is it three tusks. We’re not sure. Whatever the case this bear devours its neighbors. The reference is likely to the Medes (Darius). Then there is this leopard-like creature that has four bird-like wings and four heads. To this beast is given dominion. The thought is, this is a reference to the Persians (Cyrus). The beasts are grotesque, but recognizable. These kingdoms have great power, but as in chapter two it is not unlimited nor does it go on forever. Finally, there is this fourth beast. The remainder of the vision focuses on this fourth beast. It is terrifying, dreadful, “exceedingly strong.” It has iron teeth and what it doesn’t it crushes under its feet. Oh, and it has ten horns, three of which will be removed with the Little Horn, with human-like eyes and a mouth that speaks arrogantly emerges. This beast is so monstrous no description can be given. Is it animal or something else? As to the referent, it would most likely be to Alexander and his Seleucid successors. The Greeks were considered rather violent conquerors. One could look at Alexander’s conquests as the means by which Greek civilization was spread across the globe, but for the writer of this book and its recipients, Alexander and his successors weren’t bearers of good news. They were the destroyers. The prior kingdoms had their problems, but they were unlike this one. As for the Little Horn, he was unlike his predecessors. He was not only cruel, but he was arrogant in his war against the Holy Ones. Consider the description offered of him. There is some thought that this chapter, which was originally written in Aramaic predates the others. It might have originated earlier in the Seleucid age, and then rewritten to include Antiochus IV later. We simply can’t say for sure, but there are differences. The point however is that there are beastly empires who fight against God, and the question asked by Daniel and the audience of this book is whether they will succeed? In answer to this, Daniel offers the vision of the Ancient of Days (Ancient One) who sits on the heavenly throne. 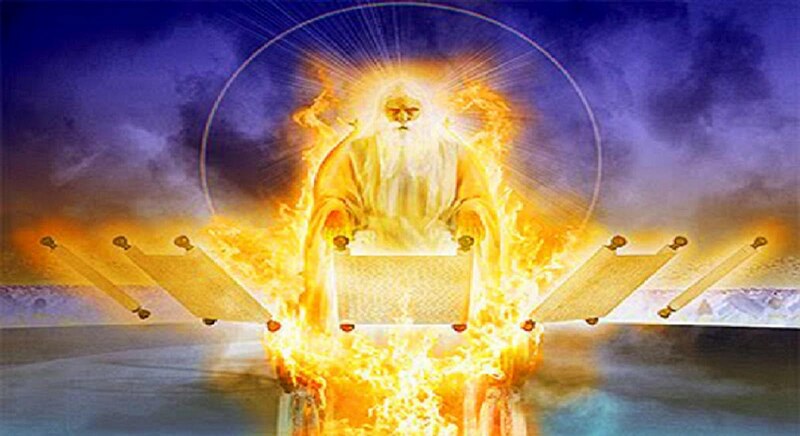 While generally God is not described, here we have the Ancient of Days described as clothed in a blazing white robe with hair like pure (white wool). The message here is one of divine glory, beaming brightly. Note here that the throne is comprised of fiery flames with wheels like burning fire. This reference, especially since fire streams forth from the presence of the Ancient of Days suggests judgment flowing out toward these beasts. Surrounding these thrones (there is more than one), are heavenly servants, a heavenly court attending to the Ancient of Days. This court stands in judgment, and the books are opened. When they’re opened, we assume they have something to say or something is recorded. Most likely it has something to do with the Beasts. While the Little Horn prattles on arrogantly, posing as one of great power and authority, Daniel sees one like a Human Being (Son of Man) coming on the clouds of heaven from the Ancient of Days. This Human Being is given dominion, glory, and kingship, so that all people and nations and languages will serve him and will reign forever. You can understand why this reference is applied to Jesus, who was known to speak of himself as the Son of Man. Who is this one who comes from heaven? The answers vary. Ultimately, whoever it is, they will defeat the Little Horn who prattles on arrogantly. We’re told that Daniel is troubled by what he sees. He needs more information, more clarity. Who are these beasts? More specifically he wants to know more about the exceedingly terrifying fourth beast, with ten horns, three of which are removed. What does this refer to, and who is this Horn that makes war on the Holy Ones, the Saints of God? We’re not given a full identification, but those in the know, know that it is Antiochus IV who styled himself as Theos Epiphanes (God Manifest). It is this Seleucid king who imposed himself on Jerusalem, who tried to turn Jews into Greeks, and replace the Jewish religion/faith with that of the Greeks. He defiled the Temple and placed a statue of Zeus. He is the evil one. Yet, as we learn here and elsewhere, he doesn’t succeed. There is the promise of deliverance. Dominion will be given to the Holy Ones, and the arrogant king who styled himself as divine will be judged and destroyed. Yes, and the reign of the Holy Ones will everlasting. What does Daniel do with this? He keeps all this to himself. He is terrified by what he sees, but ultimately, there is a word of deliverance. So, what should we make of this? Is this simply an old-fashioned apocalypse that speaks to long past realities? Or is there message about resilience in the face of monsters. The message we heard in chapter two, and which is reprised here is that empires come and go, rise and fall, but the realm of God, it continues forever. The Human Being (Son of Man) who comes from the Ancient of Days, offers a different vision than the monstrous beasts, including the fourth beast. Antiochus didn’t win. He lost. For the Jews that was, at least for the moment good news. Unfortunately, as we saw this past weekend, Jews have been often found themselves in this same kind of situation. Anti-Semitism has a long and violent history that includes pogroms and genocide (Holocaust). But the hope remains. Judaism remains strong and vibrant. The promise here is that God is present amid all of this. For we who are Christians, Daniel and his visions are a continual reminder that we are not to serve the beast, but rather join with the Holy Ones in service to the Ancient One, the Most High. Remember, the Realm of God comes not from the sea, but from the heavens, with the Human Being riding on the clouds! And as Brian Zahn reminds us this realm is “not beastly; it’s humane. That’s why we long for it; that why we celebrate it; that’s why we welcome it.” For Christians that means “Here, now, and forever, Jesus is Lord.” [Zahn, “The End of Beastly Empire,” in Preaching as Resistance, Phil Snider, ed., p. 150].